It&apos;s little, it&apos;s cute, but it performs just like its big brothers! The HyperStar C6 is a perfect match to one-shot color CCDs like the Atik 414EX or Starlight Xpress Trius SX-674, as well as video systems such as the Mallincam. Capture up to a 3.2-degree field of view at an amazingly fast focal ratio of f/1.9! HyperStar is based on Celestron&apos;s innovative Fastar feature. This feature allows the secondary mirror to be easily removed (and later easily reinstalled) from Celestron&apos;s Schmidt-Cassegrain telescopes. By mounting the HyperStar lens assembly in place of the secondary mirror, a CCD camera can be mounted at the front of the telescope allowing for a wider field of view and much faster imaging. The HyperStar lens works with a variety of cameras. Different cameras require different adapters, however. One adapter is included with the HyperStar lens. Please specify the camera being used when ordering. A holder is included for safe storage of the secondary mirror while imaging. 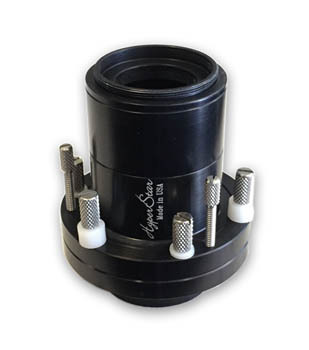 Also included with the HyperStar C6 is a replacement secondary mirror mount that makes the secondary mirror easier to remove than the standard mount that comes with the telescope. Donald Rudny uses Starizona&apos;s HyperStar lenses for public outreach on Mauna Kea, Hawaii, and wrote us to tell about his experience: "We use two Hyperstar systems, one with a C14 EdgeHD and the other with a C6 Evolution. We have been using the Starlight Xpress Ultrastar recently for outreach with visitors, and the images have been superb. The visitors have been amazed with what we can achieved in near real time. The Hyperstar is the key in producing AP like images in short exposures. There&apos;s nothing faster at f/1.9." Length (without camera adapter)*: 2.7"
* With a typical camera adapter, the HyperStar lens protrudes out from the front corrector glass of the telescope about 3.1"